VOLUME 7 FROM 509, TAKES THE SNOWMOBILE FILM INDUSTRY TO A WHOLE NEW LEVEL. FEATURING THE INDUSTRIES TOP RIDERS PAIRED WITH NEVER BEFORE FILM TECHNIQUES, VOL 7 IS A VISUAL MASTERPIECE THAT WILL KEEP YOU ON THE EDGE OF YOUR SEAT FROM START TO FINISH. FILMED USING MULTIPLE RED CAMERAS & GYRO STABILIZED HELICOPTER CAMERAS, WITNESS WHAT HAPPENS WHEN THE INDUSTRIES BEST RIDERS, WEARING THE BEST GEAR, AND FILMED WITH THE BEST CAMERAS, TAKE TO THE BACKCOUNTRY AND RAISE THE BAR. FILMED & PRODUCED BY PHIL YRIBAR & TOM DELANOY. STARRING: CHRIS BURANDT BRETT TURCOTTE DAN ADAMS CHRIS BROWN KALLE ‘KJ’ JOHANSSON JAY MENTABERRY KEITH CURTIS TROY BOYZ STEPHEN DARCY PHIL YRIBAR SMASHER ALPINE ASSASSINS AND MANY MORE... FEATURING: Big mountain backcountry snowmobiling. 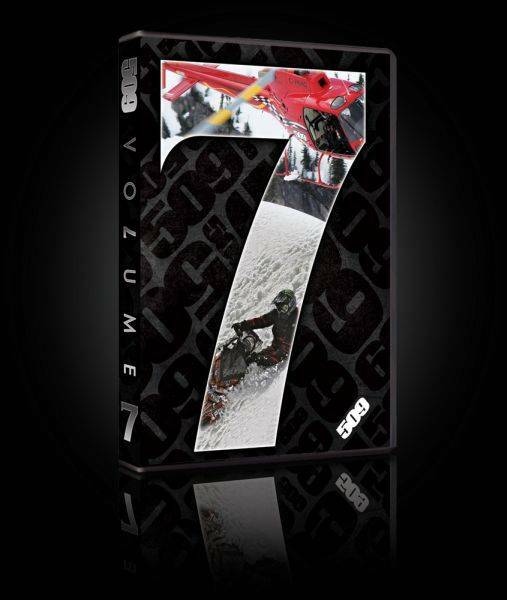 Volume 7 is a well rounded film featuring technical tree-riding, deep powder, huge jumps & drops, hillcilmbing, even CARNAGE. Estimated length 60 minutes.